PC players have been waiting on GTA V long enough that some people jokingly called the Steam launch “Christmas day.” Seriously. 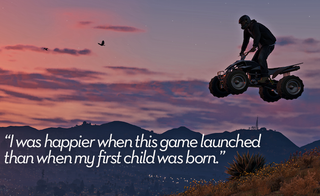 That’s just how hyped PC GTA fans were! Now that people have had a chance to give the crime simulator a whirl, the user reviews on Steam have started to trickle in. And boy, are people excited about the game. You can expect a few key things from GTA Steam reviews. There are some inevitable jabs at both Watch Dogs and console players. PC elitism is alive and well, in case you were wondering. You can also expect jokes about how good the game looks, and jokes about how people are about to abandon real life for the streets of Los Santos. You can check out more GTA V reviews here, or take a look at our ongoing “As Told By Steam Reviews” feature here.